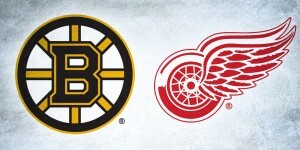 The news came down a few weeks back that once Adidas starts taking over manufacturing of the NHL’s jerseys next season, there will be no third jerseys for any team in the league. At least (probably) just for next season. There are 17 teams in the league that have third jerseys, which means we’re going to say goodbye to 17 jerseys this year…but maybe they won’t all be the third jerseys. We thought it might be a good time to look at teams that could actually benefit from ditching their current home jersey and wear their thirds for 41 games next year instead. Out with the old, in with the not-so-old! Edmonton (pictured above) has already announced that they’re planning on doing just that…but did they make the list of the Top 5 teams who should do that? Keep reading and find out. 1. 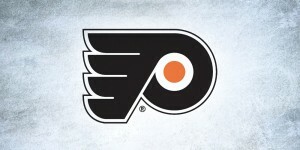 Their third jersey is just go great is doesn’t deserve to filed away in the jersey history books. 2. 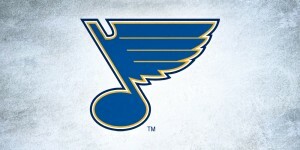 Their home jersey is so bad that anything would be better. 3. 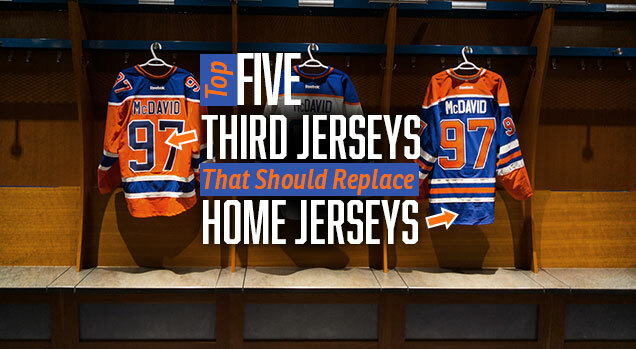 A less extreme combination of #1 and #2 – or, put simply, the third jersey is just better. This is a #3 (from above). The Avs are a team desperately in need of a refresh, both on-the-ice and…what they wear on the ice. Their logo isn’t highly-rated, their jerseys need some help, and while they have a great unique blue-burgundy colour scheme, it may be time to think about hitting the refresh button a few times. 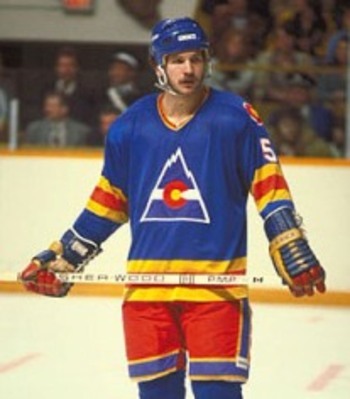 The simple Colorado-flag-inspired logo crest (which also alludes to the previous Denver-based NHL team – the Rockies), snow-capped shoulder yokes, and a nice balance of burgundy included makes this jersey the preferred one to keep next year. I’m not a huge fan of the navy blue, or the size of the shoulder yokes (making these drop down this list), but it’s still an improvement. Or at least, it’s a chance to start new. Another #3, where the third jersey is just better than the home jersey. Or, in this case, the third jersey is at least more interesting and innovative then the home jersey, which is little more than a solid blue jersey with a few thin stripes on it. 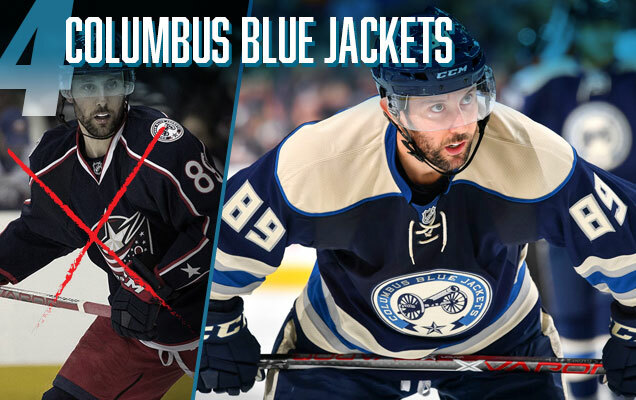 On top of that, the two tones of blue are more unique than the red, white and blue combo, with the “heritage white” (aka off-white) really working with the aesthetics of the alternate logo. And said logo is better than their regular one anyway. 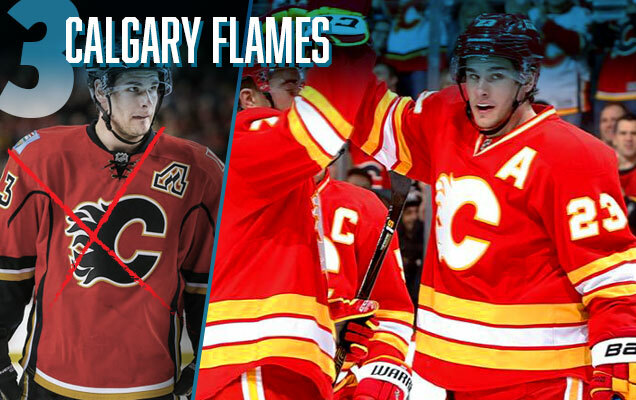 Overall, the third jersey just has way more character, so it’s an easy choice. This is a #2 influence, because their current jersey set is just a mess of stripes that make no sense at all, with a black line that just ends mid-sleeve, which curves around a blackened armpit, which also cuts-off multiple vertical striping along the side. And none of these actually follow a hem-line at all, so the decision-making process behind it is a bit baffling. And depending on how you feel about the black-C logo in the middle, it’s time to completely cast it aside. In its stead? Their third jersey, a replica of their original jerseys that have seen much better days than these ones have ever known. If you could just go ahead and get rid of their current road jerseys too?…That’d be great. This is a #1 influencer. 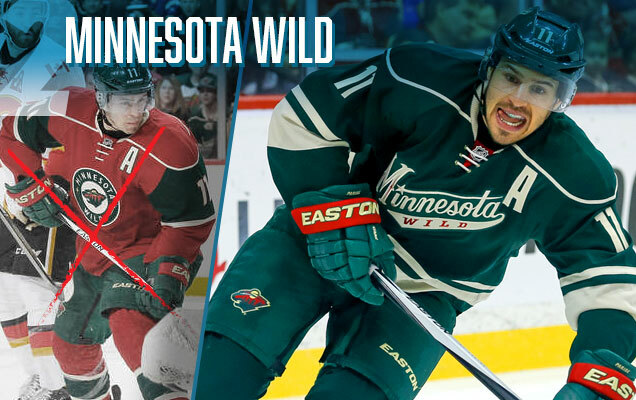 Both their third and home jersey are great jerseys in their own right, but those solid greens are just so unique and classy that I’d be heartbroken to see them gone from the game. 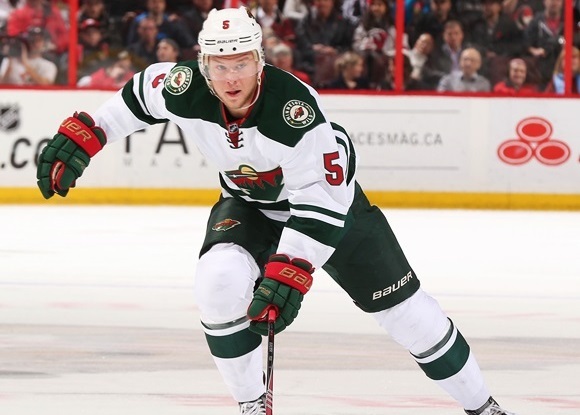 There’s an argument to be made that the third jerseys are more visually connected with their road whites anyway, making for a more consistent jersey set…the striping patterns are much more similar and red plays a much more subdued role in each, letting the forest green dominate the jerseys. 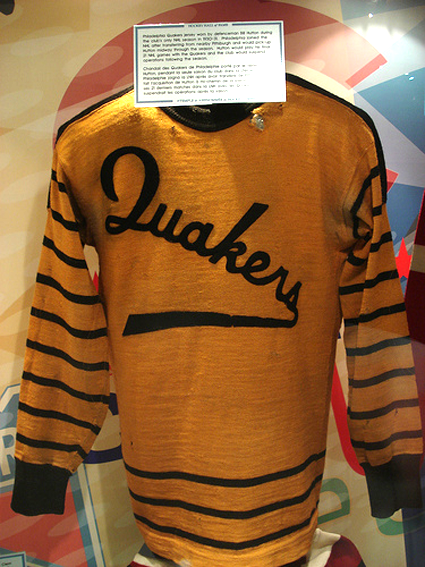 Plus, it’d be a shame to see the only jersey that has successfully pulled-off a script font since the Quakers be put out to pasture. I say dump the reds. This is influenced by both #1 and #2. 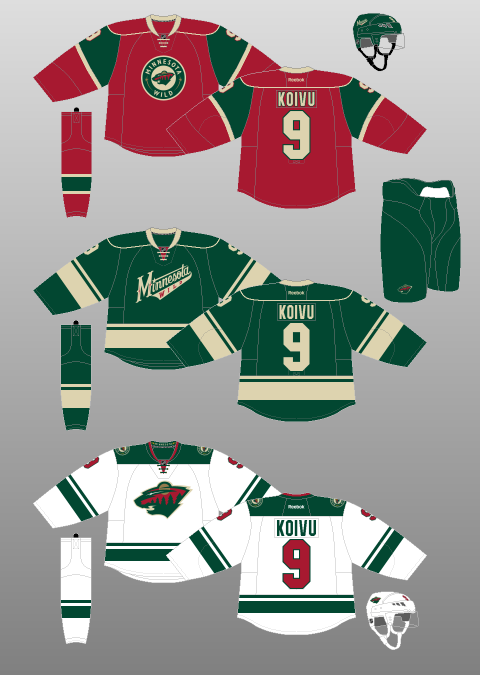 Their historic third jerseys with a simple “O” crest and a red/white combination chest stripe manages to balance a fine line between historical, modern and unique. They are, simply, one of the best (the best?) third jerseys in the league. 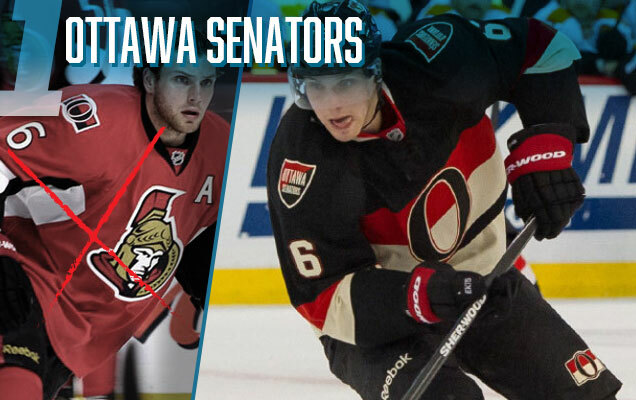 Meanwhile, their current home jerseys, with blotches of black and white thrown haphazardly around the jersey with a cartoonish Roman gladiator crest on the front that introduces a new colour (gold) that looks painfully out-of-place are among the worst regular home jerseys in the league. Really, this should be the easiest decision Ottawa makes all season long, and it’s something we’ve also explored in length previously. That easily gives it top spot on this list. 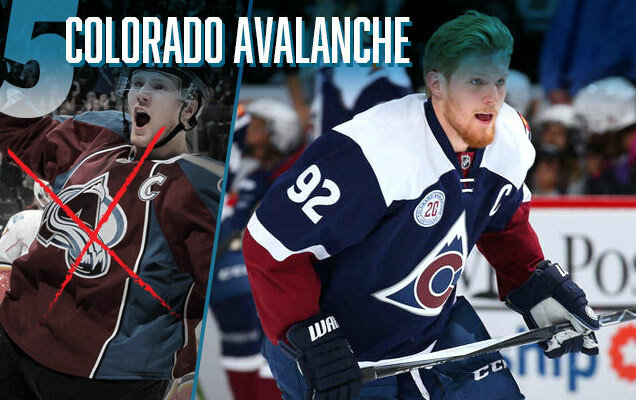 I may be alone, but I’m a BIG fan of the Avs third jerseys (actually the whole uniform), particularly since it gets rid of of the black pants and helmets. You’re not alone. I know there’s lot of fans out there of the Avs third jersey.